Supply, installation, testing and commissioning of PLC, HMI and VFD for compressor management control in seafood industry. Seafood processing industry is based on refrigeration which involves multiple compressor systems and theses industries are facing losses due to unpredictable machine trips and high energy consumption. These customers were looking for a VFD based compressor control solutions to enable easy control and monitoring of compressor system through HMI. For maintaining a smooth and steady temperature in storage area, suction pressure based PID control algorithm was provided. The suction pressure of the evaporator chamber indicates the temperature in storage area. A pressure transmitter is fixed in compressor suction line to serve this purpose. Pressure transmitter senses the pressure and gives feedback to PLC. 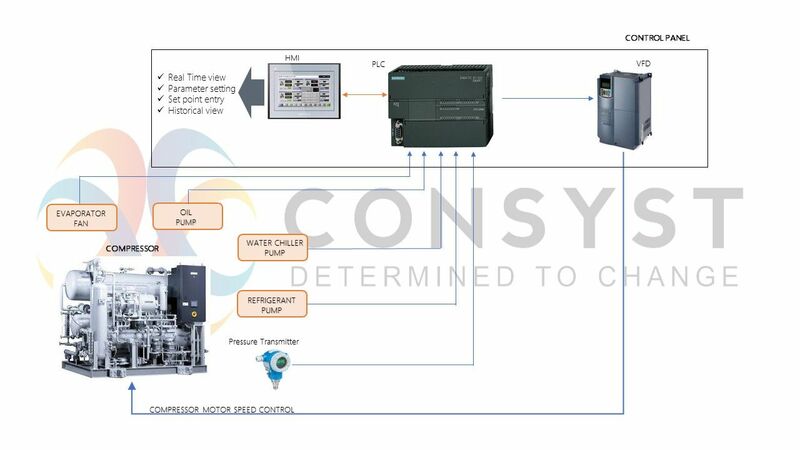 The PID output then controls the machine speed through a variable frequency drive, thus controlling the compressor according to temperature demand. The entire process can be monitored in real time value in the HMI & the user can enter the set point from HMI to the system. PLC system provides interlocks and monitors evaporator fan, oil pump, water chiller pump, refrigerant pump, oil pressure, suction pressure and discharge pressure. Also, an hour of defrosting per day is done to ensure heat transfer capacity of the system. The customer is benefitted by improved energy efficiency and machine life due to speed control of compressors according to temperature demand. This solution allows optimum utilisation of machines through load sharing and speed control. Machine monitoring parameters avoid unexpected trips and allows planned maintenance. Auxiliary pumps and fan interlock increase safety and performance.